Welcome to our 2016 year-end newsletter! This quarter we highlight Zurich Instruments' recent innovations for our customers, introduce the latest additions to our Premium Customer Care team and announce new educational media, including a white paper and a video on the principles of lock-in detection, plus there's an exciting customer interview. We also announce our next scientific workshop grant call. Two new products were released this year: an Arbitrary Waveform Generator (AWG) and an Impedance Analyzer, both of which integrate with our existing hardware. 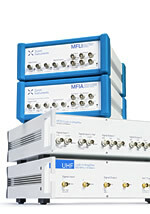 The Zurich Instruments UHF-AWG, launched in June, is the world's first AWG that integrates full-fledged signal analysis, including a scope, digitizer, demodulator and pulse counter. It is equipped with the LabOne Waveform Sequencer, a simple language to efficiently program waveforms and sequences. Our sequencer links measurement results with complex waveform output for fast sequence branching. The article below describes using the UHF-AWG in combination with the internal Oscilloscope to perform wide-band leakage-free spectral analysis over a defined frequency range. In August we launched the MFIA, the first Impedance Analyzer and Precision LCR meter that validates your measurement results with its unique LabOne Confidence Indicator and LabOne Compensation Advisor. These features help you to get even more accurate measurement results from samples. Note that the direct measurement technique used, as opposed to the historical balanced-bridge approach, extends frequency and measurement ranges into new territory. Check out our article below on equivalent series resistance (ESR) measurements of super-capacitors (Super-Caps) to get a feel for the instrument. 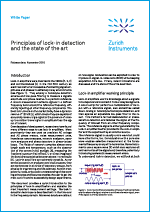 We recently published a White Paper explaining the mathematical basics of lock-in detection and the lock-in amplifier state of the art. No time to read it right now? Then watch the new video with Jelena Trbovic, explaining lock-in essentials. 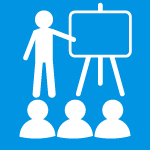 Are you still looking for additional funding for your next conference or workshop? Don’t miss our announcement of the Zurich Instruments' 2017 Scientific Workshop Sponsorships. We are looking forward to 2017 and to bringing you further innovations, all the while continuing to add to our team of application scientists to help meet your needs. Zurich Instruments would like to extend best wishes to all of our customers, friends and associates for the year end and a peaceful, successful and happy 2017 with lots of exciting measurement results! How does a lock-in amplifier work? What are the critical parameters to set? Which features are important to consider when buying a new instrument? What is the state of the art? The time has come to provide answers to the above questions with a focus on cutting-edge instrumentation. Since its invention in the 1930s, lock-in detection has gone from vacuum tubes to FPGA-based digital signal processing. The last couple of years have also seen dramatic changes as relentless integration increases the range of tools and features implemented in a single instrument. We recently published, “Principles of lock-in detection and the state of the art” and an associated video, starring Jelena Trbovic, to help increase understanding of lock-in demodulation, including the mathematical calculations that underpin it. We discuss both the time and frequency domain of signal mixing, low-pass filtering and the latest innovations using the Zurich Instruments UHFLI, a 600 MHz lock-in amplifier, as the model. Did you recently find yourself browsing the web for pre-Nobel-prize gossip after starting a long frequency sweep? Next time, consider reading our recent blog post about achieving fast, high-resolution frequency response measurements instead. The example below demonstrates the benefits of combining custom signal generation with the advanced detection tools of the UHFLI Lock-in amplifier, enabled by the UHF-AWG Arbitrary Waveform Generator. A system's frequency response is often measured by sweeping the frequency and recording an individual lock-in measurement for each spectral point. An alternative method that dramatically reduces overhead time is to drive and simultaneously measure all frequencies by applying a periodic chirp stimulus, while calculating the fast Fourier transform (FFT) of the response signal. This eliminates issues with step-wise measurements, such as device ring-up, instrument communication, or filter settling. We've seen our systems deliver significant speed increases for high-Q resonator characterization and laser Doppler vibrometry, for example. Only with sample-precise synchronization of generated and acquired signals is it possible to perform measurements that are truly free of spectral leakage, a spurious effect that is otherwise unavoidable when measuring FFT spectra with digital instruments. LabOne's Cross-Domain Trigger provides this synchronization between the UHF-AWG and UHF-DIG Digitizer. Both units, AWG and Digitizer, come with a large memory of 128 MSa - because speed is nothing without resolution! Check out Bruno Küng's latest blog post for more detailed information how to implement fast spectral analysis in practice. 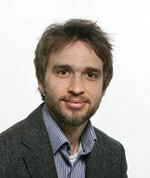 Malcolm R. Connolly is an EPSRC Early Career Research Fellow in the Semiconductor Physics Group at Cambridge University. Hi Malcolm, what is your position at Cambridge and is it difficult for a scientist in the early stages of their career to handle all the demands of organizing a group? I am currently an EPSRC early career research fellow setting up my lab at the Cavendish Laboratory in Cambridge. The fellowship is nice as it gives me a few years to develop independence and pursue some riskier ideas. It is definitely tricky getting the right balance between building momentum in and out of the lab while keeping a weather eye on where my career the rest of field is going long-term. Managing a team working on different approaches to a problem certainly keeps me on my toes! What is your research focus right now? The focus of my research is on understanding the quantum behavior of 2D materials such as graphene and topological insulators at low temperatures and seeing where we can exploit their properties in quantum devices such as qubits and single-electron pumps. A big part of what I do involves using low temperature scanning probe techniques to visualize quantum devices and get an early handle on how to exploit them in applications - for instance, my microscopy work on graphene nanostructures [Phys. Rev. B 83, 115441 (2011)] guided us in the development of a single-electron pump that has potential as a current standard in quantum metrology. Where does your research fit in the big picture? There is a big drive to use quantum effects such as superposition and entanglement in a wide range of applications, computing and sensing for example, but there is still lots to do. By pushing the boundaries with quantum materials and translating this to proof-of-concept devices I hope my research can open up new and unexpected avenues and approaches in future quantum technology. It is also exciting that we can develop bench/fridge-top tests of fundamental ideas in quantum physics using relatively simple solid-state devices. As for commercialization, when making quantum devices you nearly always end up finding solutions to similar problems faced by technology slightly closer to home, so we try to keep up to speed with the latest applications of 2D materials. What is your most significant publication and why? Probably my publication describing the high-frequency operation of a graphene single-electron pump [Nature Nanotechnology 8, 417 (2013)]. There is a lot of interest in pumps at the moment because in future they will probably be used as a current standard, leading to a redefinition of the Ampere in terms of the fundamental charge on the electron. Unlike GaAs and Si the band structure of graphene is not really suited for confining single electrons, but this paper showed that it nonetheless works at much higher frequency than was achieved in previous metallic pumps. You have Zurich Instruments UHFLI for some time now in your lab - how does it fit in with your work? We do quite a bit of radiofrequency engineering to allow us to manipulate and probe quantum devices on short timescales. For instance, demodulating the signal reflected from an RF tank circuit coupled to a graphene quantum dot allows us to measure single electron tunneling and relaxation events. Here the UHFLI fits in nicely as the 600 MHz input bandwidth is compatible with our typical RF tank circuits and the demodulator bandwidth of 5 MHz allows us to monitor fast processes. I like the fact we can do basic tests on new RF circuits quickly at room temperature as well as get creative with actual experiments at low temperatures, for instance by using frequency multiplexing and multiple demodulators to probe different parts of the device, or using the boxcar option to perform pulsed measurements. Thanks a lot Malcolm. One last question. You said earlier your partner is Italian, what is your favorite Italian dish? Pizza happens to be one of my favourites full stop actually. She will testify that I am constantly searching for the perfect one! N. Rossi, F. Braakman, D. Cadeddu, D. Vasyukov, G. Tütüncüoglu, A. Fontcuberta i Morral, and M. Poggio "Vectorial scanning force microscopy using a nanowire sensor" in Nature Nanotechnology, online ahead of print 17 October, 2016. Z. Schumacher, Y. Miyahara, A. Spielhofer, and P. Grutter, "Measurement of surface photovoltage by atomic force microscopy under pulsed illumination" in Physical Review Applied, Vol. 5, Issue 4 (2016). F. Emaury, A. Diebold, A. Klenner, C. Saraceno, S. Schilt, T. Südmeyer, and U. Keller, "Frequency comb offset dynamics of SESAM modelocked thin disk lasers" in Optics Express, Vol. 23, Issue 17 (2015). Ever wondered how to correctly measure the equivalent series resistance or ESR of a super-capacitor? It's a question we're very happy to answer. Using the recently released MFIA Impedance analyzer our newest team member, Tim Ashworth, explains in his first blog how lock-in based impedance measurements are used to characterize super-capacitors. The intuitive Sweeper feature on the MFIA enables frequency-dependent impedance measurements from 1 mHz up to 5 MHz. The results for a 3000 F super-capacitor show an ESR of about 0.3 mOhm, measured at 1 kHz. In addition to the ESR, valuable information about the capacitance, dielectric loss and phase can be gleaned from a single impedance sweep. Read more here about these measurements, including interesting background information on super-capacitors. We are enhancing our premium customer service by increasing the quality and size of the team of our application scientists. You'll be able to meet our new colleagues Tim Ashworth and Mehdi Alem, introduced below, at upcoming conferences. Dr. Tim Ashworth (tim.ashworth@zhinst.com) obtained his PhD degree at the University of Manchester, UK in the field of Nanoscale surface science, focusing on UHV SPM. Tim subsequently worked as a Post-doc at the University of Basel, using lock-in technology and PLLs to get the best possible results from their home-built SPM. 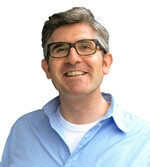 After a move into the SPM industry in 2008, Tim has over eight years’ experience of worldwide applications support and scientific business development. In addition to strengthening the SPM knowledge at Zurich Instruments, Tim joins us as an Applications Scientist with a focus on our impedance analyzer range. 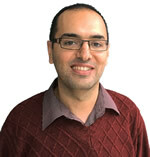 Dr. Mehdi Alem (mehdi.alem@zhinst.com) received his PhD in photonics from École Polytechnique Fédérale de Lausanne (EPFL) in May 2016. During his doctoral research, he focused on the theoretical modeling and experimental measurement of optical nonlinear effects such as modulation instability and four-wave mixing in distributed fiber sensors. Before starting his PhD, he spent 6 years as a research engineer at Optical Networks Lab of Sharif University, Tehran, Iran. In addition to supporting customers for scientific applications, Mehdi will enhance the photonic application knowledge at Zurich Instruments. We will run two evaluation rounds, reviewing submitted events (in December 2016 and February 2017). Selected events will be promoted on our social media networks. We will also attend the supported workshops and welcome participation of other commercial companies. Please contact Eva Rojcek for more information and/or with details about your event.